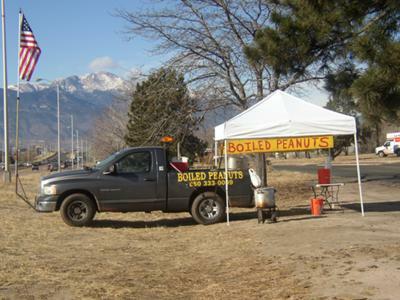 Bootleg Dave's Boiled Peanuts in Colorado Springs, Colorado on Platte between Murray and Wooten by the big pine. Also now in Falcon, Colorado. We have Traditional (salty) and Cajun Spice. We also cook Skins and Cracklins. Matthew wants to know when the peanut man is coming back? Hope you are having a good time! Hey David! WTG, Got to be cold up there. Stay warm. Miss you and Annette. Hope all is well. Thanks to all our customers & friends for all your support and business. We have had stands in three different states (Georgia, Florida, and Colorado) and have met a lot of great people. I just saw your site. You give me inspiration! If the product is great, they will come! Thanks for the great deal Saturday. Those boiled peanuts and pork skins were a hit even for our "Northern" minded guests. It was perfect for snacking while we waited on our bbq to finish. Thanks! I'm a southern boy, and boiled peanuts are hard to find out west and up north. Great peanuts! Thanks Papa Tom, Joe and Robert for your posts. We are working on Bootlegdavesboiledpeanuts.com so everyone go check that out. So glad we crossed paths you my friend make the best boiled peanuts. So tender and juicy. The family and I enjoy every peanut down to the last pod. When will you be in Colorado Springs? I have been craving boiled peanuts and I'm pregnant. I am missing my southern food. You still doing boiled peanuts? Still gonna be on Platte near Wooten, or doing any farmers markets? Keep us updated please and thanks! Are you still in Falcon? I've driven by a few times and I haven't seen you; are you still selling in Falcon? Dave - are you still in business? Have been trying to find you! It's not football season w/out boiled peanuts! Are you still in Colorado Springs? Still selling boiled peanuts in Falcon? Hello! I'm dying to find some boiled peanuts - are you still out in Falcon? Where can we find you? Will you have cracklins this week in the springs?